What is Lean Six Sigma (Supply Chain Management)? Lean concepts are very demanding in manufacturing field for efficient handling of business operations through best practices of operations management. It has also become popular for its universality across the business operations of many areas. These areas might be referred as lean enterprise, lean manufacturing and lean production and operations management. Lean Six Sigma is a collaborative and team based effort to systematically improve the performance by eliminating waste which might be defective products, over or under production, stock out situations, and inefficient utilization of talent, inventory, working coordination and transportation problems. Lean Six Sigma concept is not an old one. It was first time published in a book in 2002. Supply chain management in marketing area is concerned with management of distribution and supply chain network in a way that product with high-quality features successfully delivers to target market customers at right time with minimum cost. By application of Lean Six Sigma in supply chain management, a manager or business owner can identify and solve the supply chain problems. This practice also creates a specific target for elimination. It works on the basis of the end customers in order to continuously offer products and services that have enough value and capable of satisfying consumers need. Lean Six Sigma (Supply Chain Management) is very insightful and brief guide to lean application and marked as valuable resource for retailers, distributors, suppliers, wholesalers and other members of supply chain network. Being an expert in the field of supply chain management with best practices of value addition and elimination of wasteful processes through Lean Six Sigma philosophy is now possible with the existence of Brainmeasures certification program. This course is available at Brainmeasures is developed in such an understandable manner so you will no longer find it hard to master all the essential concepts and strategies related to the field. You will learn about basics of supply chain management as well as also get to know about different players of supply chain network and how they integrated with each other in the process of procurement of inventory, the apply some processes, transform into final products or services after value addition and deliver the same to customers with premium quality. The kind of knowledge and expertise of Lean Six Sigma application in supply chain management that you can get from this certification course is developed in such a way that you will no longer have a hard time understanding all the strategies that you can use when it comes to improving the level of efficiency, when operating your business especially the factors that are associated to management of distribution channels for end customers. With the help of the Lean Six Sigma (Supply Chain Management) certification course offered by Brainmeasures, you will no longer find it hard to master everything about Lean Six Sigma concepts, how you can successfully implement this practice and how to make sure that you continuously receive benefits from its implementation. You will be recognized as a certified Lean Six Sigma (Supply Chain Management) expert who is capable of implementing the process without dealing with any difficulties. Earning the prestigious Lean Six Sigma (Supply Chain Management) certification from Brainmeasures is also extremely useful for you especially if you are expecting for higher salary in supply chain and marketing areas. After getting Lean Sig Sigma certification with other qualification and level of experience, you can expect to earn at least $82,000 annually. This may go beyond further and you can earn up-to $130,000 that is based on your prior education and expertise in the efficient use of Lean Six Sigma approaches and philosophy in supply chain management. 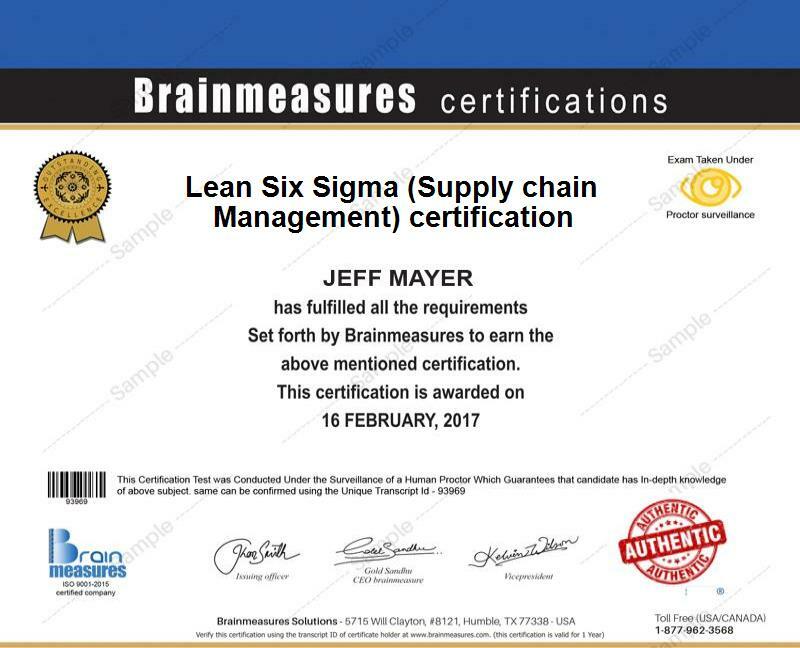 Enrolling in the Lean Six Sigma (Supply Chain Management) certification program offered by Brainmeasures is extremely beneficial to numerous individuals considering the fact that it is effective in honing their skills and knowledge in the field of supply chain management and marketing management with application of Lean Six Sigma. You can expect this certification program to work more suitably for managers, operations managers, marketing managers, distribution channel members, supply chain managers, retailers, wholesalers and professionals in the operations, manufacturing and production departments of a business organization who wish to enhance their understanding about the lean practices and taking advantage of it in achieving production, manufacturing and operations excellence with in depth knowledge about Lean Six Sigma (Supply Chain Management).